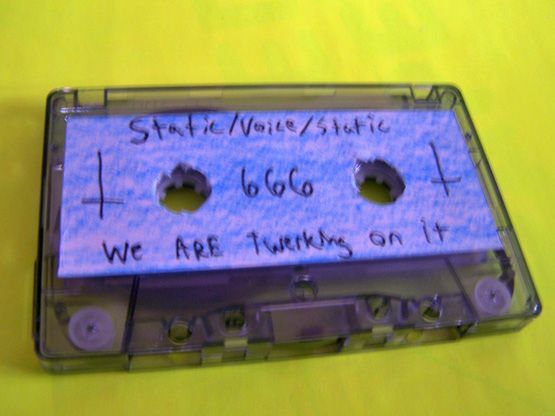 What I think I like most about Static/Voice/Static- and I found it to be perhaps most true with this cassette- is that there is this sort of sense of floating around and just drifting aimlessly throughout the music, but then when the cassette itself reaches the end the music has a way of wrapping itself up. When you’re listening to it, you kind of expect it to get cut off but it doesn’t—it always ends on purpose. My best comparison for that is to think of it as going on a long drive with no real destination, yet you just all of a sudden pull over for whatever reason as if you meant to go to that place all along. Side A, which is the titular track, begins with this sort of moaning sound or perhaps it is that of monks chanting, I am not sure. There is a certain background hymnal type of synth which is gloriously angelic. It reminds me of a combination of Dead Western and Illegal Wiretaps. Then, the cyber synth lasers kick in. We’ve entered full on space fight mode. There are bowls/glass type of noises that remind me of Jay Peele. The sounds maintain, yet somehow also falter in time and space. It would appear to me as a giant cosmic loop. While it could be said that Side B (or “Get High, Twerk and Die”) is similar in structure as far as being in space and all that is concerned, the one thing that obviously would stand out to me about it over the previous track is that it has this j-pop quality to it while also manipulating the vocals. Most of the time, the manipulation comes from speeding up the vocals and this is done to accompany the fast paced beats that, yes, make me think of a j-pop artist. Ever since “May I Always Love You”, I’ve felt this connection with Static/Voice/Static to the world of anime and manga and this particular release does bring that out for me some more, thus confirming some of my suspicions, even though it is not the heart of the story. That being said, this entire story being told on this cassette could be set in space and, well, if you’re looking for anime/manga set in space you could always start with “Cowboy Bebop”.